23 AWG, bare copper wire insulated with FEP. Two insulated conductors twisted together to form a pair and four pairs laid up to form the basic unit. 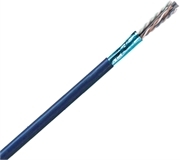 The cable is shielded with an overall polyester/aluminum foil with a 24 AWG stranded tinned copper drain wire and jacketed in flame-retardant PVC.